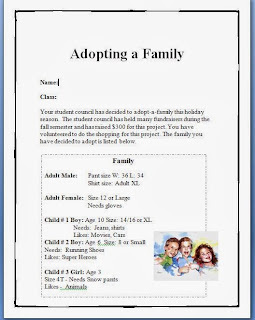 This project idea came out of trying to have awareness for needy families. I have tried different versions of this project many times and have had success in every way with it. The students really love this project. They get the chance to bring in advertisements, catalogs and flyers as well as shopping online. They really enjoy the challenge of trying to shop for a family and helping them out. I have done this around Christmas time with a lot of success. The students learn about adding, subtracting and multiplying with decimals, staying within a budget and about how much presents cost during the holiday season. We also added in pricing out all the materials for Christmas dinner and this year actually took our classes to the local grocery store to price it all out. The people working there were awesome and taught our kids about what gets taxed and what doesn't. What I genreally do is create many different types of needy families and make some more challenging than others and then selectively distribute them to the kids. The displays and creativity of the procjects coming in have been amazing. Christmas trees, stockings, prezis, powerpoints, posters, mock presents have all been parts of projects recieved during this project. I have also been amazed at how seriously most students take this and often have them come to me with coupons and deals that they have found. I usually accept all of them but the students have to show the calculations on how much savings there are. Here is one of the criteria sheets I give. All the criteria sheets are here. 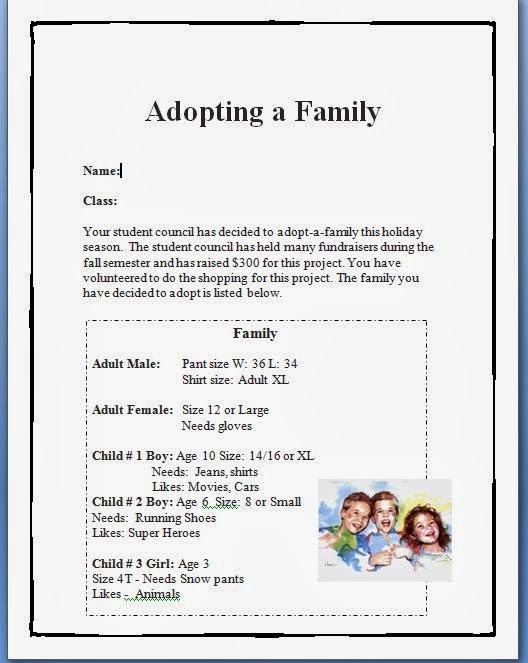 Your class has decided to adopt-a-family this holiday season. The class has held many fundraisers during the fall semester and has raised $300 for this project. You have volunteered to do the shopping for this project. The family you have decided to support is listed below. Your task is to decide what to buy the family. You must meet the following specifications. § The parents have requested that each child only get one toy, since they are in desperate need of winter outer clothing and other basic clothing. 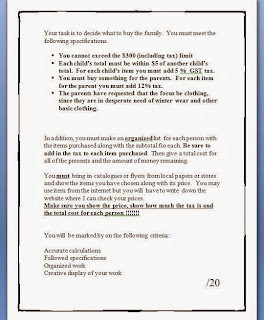 In addition, you must make an organized list for each person with the items purchased along with the subtotal for each. 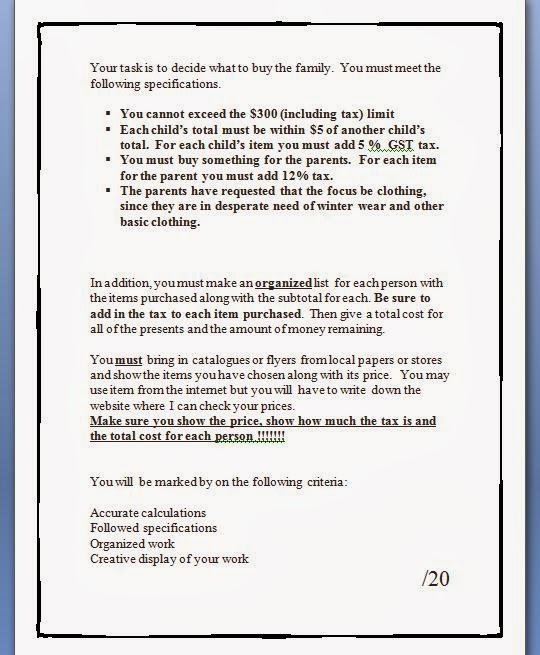 Be sure to add in the 13% tax to each item purchased except for children’s clothes which is 6%. Then give a total cost for all of the presents and the amount of money remaining. You must bring in catalogues or flyers from local papers or stores and show the items you have chosen along with its price. Make sure you show the price, show how much the tax is and the total cost for each person !!!!!! !